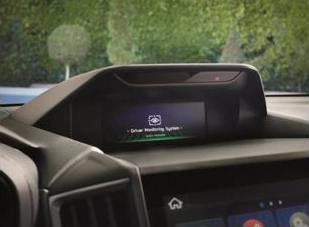 ● The latest generation of the Forester will debut the Driver Monitoring System*1, Subaru’s first-ever driver recognition technology, making for a safer and more comfortable driving experience than ever before. ● The newly enhanced direct-injection 2.5-liter horizontally opposed four-cylinder engine offers the perfect balance of excellent driving performance and environmental performance. ● Symmetrical All-Wheel Drive and enhanced X-Mode provides outstanding driving performance and the off-road drivability expected of an SUV. Tokyo, March 29, 2018 ― Subaru Corporation unveiled the all-new 2019 Forester (US Spec) at the 2018 New York International Auto Show on March 28 (local time). As a top-selling model of Subaru’s global sales, the fifth-generation Forester is positioned as a key part of the company’s global strategy. The new model features packaging that allows all passengers to share comfort and enjoyment, balancing easy handling with a spacious interior, and user-friendly features including, for the first time in a Subaru vehicle, the Driver Monitoring System. In line with Subaru’s design philosophy “Dynamic x Solid,” the new design combines the hardiness of an SUV with user-friendly comfort and convenience. The Subaru Global Platform achieves top-of-its-class collision safety and hazard avoidance, along with handling that responds exactly as the driver intended, and comfortable drivability. The latest model features Subaru core technologies including EyeSight driver assist system, Symmetrical All-Wheel Drive built around a newly developed 2.5-liter direct-injection engine, and X-Mode for enhanced all-terrain drivability, the latest model features improved performance and an everyday experience of excitement and enjoyment, offering comfort, fun, and adventure. The new Forester will go on sale in the US market in fall 2018. The new model features packaging that balances excellent handling with the roomiest cabin yet, offering comfort and enjoyment for family and friends and easy-to-use features. ・ Although the wheelbase has been increased for a more comfortable cabin space than ever, the minimum turning radius is just 5.4 m (17.7 feet), ensuring excellent ease of handling. ・ A maximum trunk opening width of 1,300 mm (51.2 inches), larger than average for a mid-sized SUV, and square cargo storage space, provide a dramatic increase in loading capacity. ・ The drive unit for power rear gate has been integrated with the gate stay and offers more cargo storage space. It also provides faster opening and closing and a new locking system, incorporated for the first time in a Subaru vehicle, makes automatic closing of the rear gate and vehicle locking with just a touch of a button. ・ Three separated pockets in the seat backs provide convenient storage for magazines, smartphones, etc. ・ USB charger ports (max. output 2.1A) provided for both front and back seat passengers. ・ New air-conditioning HMI*3, incorporated for the first time in Subaru vehicles, allows exact adjustment of temperature controls, for in-cabin comfort according to the number of passengers. ・ The debut of the Driver Monitoring System, which can alert the driver to signs of drowsiness or distraction on the road as well as automatically adjusting driver settings for seat position, door mirror angles, and air-conditioning preferences. ・ Accent colors, high gloss black, and exclusive aluminum wheels highlight the new model’s SUV robustness and sleek strength. ・ In some models with black and gray as the base colors, accent colors in the center console and seat stitching emphasize the dynamism of the interior. Featuring Symmetrical All-Wheel Drive built around the new 2.5-liter four-cylinder horizontally opposed direct injection engine, X-Mode for easier handling in poor driving conditions, and the Subaru Global Platform, the new model ensures a comfortable and enjoyable ride for the driver and all passengers. ・ The new model incorporates a newly developed 2.5-liter four-cylinder horizontally opposed direct injection engine. The new engine features around 90 percent new components compared with the previous 2.5-liter engine and introduces direct injection, improving horsepower and torque while also providing a boost to environmental performance through improved fuel efficiency, offering a powerful and enjoyable driving experience. 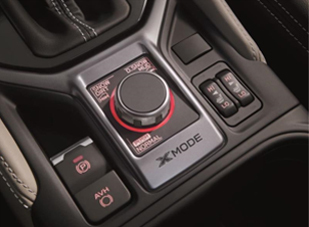 ・ SI-Drive control is optimized, and in some models S# (Sports sharp) mode allows the driver to enjoy faster acceleration and direct-feel transmission shift. ・ Optimization of the X-Mode that controls engine, transmission, and brakes on slippery surfaces and in poor driving conditions improves drivability in off-road conditions and on poor surfaces. In some models, a dial allows easy switching between two modes depending on road conditions, improving driver’s confidence and peace of mind. ・ Minimum ground clearance is 220 mm (8.70 inches), along with the widest possible approach and departure angles and the ramp breakover angle. The new model offers excellent road clearance for a wider range of activities than ever before. ・ The Subaru Global Platform brings significant improvements to dynamic quality, achieving superior driving capability that engages the emotional senses with smooth performance and pleasant drivability. The new model offers safe and enjoyable driving for all passengers at all times and in all settings―not just in emergencies―offering safety features that place it at the top of its class, based on Subaru’s philosophy of overall safety. ・ A total of seven airbags (SRS airbags in the driver’s seat and passenger seat, SRS knee airbag in the driver’s seat, SRS side airbags, and SRS side curtain airbags) come as standard in all models, providing class-leading levels of passenger protection. *4： Apple CarPlay is a registered trademark of Apple Inc. in the United States and other territories. *5： Android Auto™ is a registered trademark of Google Inc. in the United States and other territories.